As Marco Rubio campaigns for the Republican presidential nomination, he's pledging to bring generational change to Washington. Yet Rubio's policy toward Cuba hinges on reinstating a half-century-old diplomatic freeze that failed to unseat the communist government on the island where his parents were born. In the traditional litany of promises candidates pledge to fulfill on "Day One" in the White House, rolling back President Barack Obama's detente with Cuba is near the top of Rubio's list. He'd downgrade the newly opened American Embassy in Havana and put back in place tougher limits on U.S. dealings with the island. Still, Rubio says there are ways to move forward. He would be willing to allow U.S. companies to invest in telecommunications in Cuba in exchange for free and unfettered Internet access on the island. He can envision restoring diplomatic relations with Havana, but only if the government there allows opposition political parties and gives them freedom to organize. 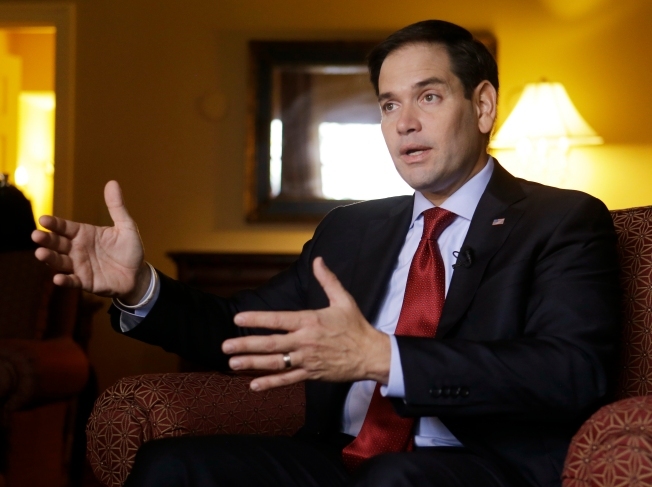 Rubio says he's also open to modifying what's known as the "wet foot, dry foot" policy. For Cubans fleeing to the U.S., it grants those who reach land permanent residency after one year, while most of those caught in the waters between the two countries are sent back. Rubio won't say what he would replace it with, but calls the policy "hard to justify" when Cuban-Americans now can travel more freely back and forth to the island. "When you have people who are coming and a year and a day later are traveling back to Cuba 15 times a year, 12 times, 10 times, eight times, that doesn't look like someone who is fleeing oppression," Rubio said. Rubio sat with the AP for half an hour in an Orlando hotel to talk about Cuba, both as a campaign issue and a personal touchstone, in the first AP Conversation — a series of extended interviews with the presidential candidates about topics of interest in the race. The outlines of that history are by now well-known. He rarely lets a campaign event pass without mentioning his parents' decision to leave Cuba and how they worked to give their children a better life in the U.S., his father a bartender, his mother a maid. The senator has never traveled to Cuba, but said he tries to keep the country's traditions alive for his young children. Still, even in a city like Miami that pulses with Cuban culture, Rubio sees his children becoming more a part of the country they live in than the one their elders came from. "America is a very powerful culture with very powerful values and traditions," he said. "You see it within one generation, certainly by two generations." Rubio says he has no qualms about fully rolling back the opening set in motion by Obama and Cuban President Raul Castro — Fidel's 84-year-old brother — about a year ago. He also thinks U.S. business people tantalized by the prospect of investing in the island will change their mind after the reality of dealing with the Castro government sets in. Rubio knows his hardline views on Cuba are also competing against a surge of public interest in the island. Even with continued travel restrictions, Americans are flocking to Cuba in record numbers for modern times. The island has attracted the occasional vacationing celebrity and plenty of U.S. media attention.